Okay this might a bit too strong of a statement. But I was struck by two articles in last week's Nature. The first one was about the possible detection of two Earth-sized planets orbiting around a Sun-like star located about a 1000 light years away. The system is called Kepler 20, it consists of at least 5 planets - 3 comparable in size to Neptune and 2 Earth size. No - none of these planets are in the habitable zone. In fact, all of them have orbits smaller than Mercury. Liquid water probably doesn't exist on these planets - and most likely no life. But is there really any reason to believe that we won't find any earth-sized planet in the habitable zone of a sun-like star? If you are betting person, would you really bet against this possibility? In fact, guessing from the pace of things, I think we will have such candidate planets within the next 2-3 years, if not sooner. Wither the uniqueness of Earth. Ten years ago, human minds were thought to be unique in their ability to connect. But as The Primate Mind shows, there has been a revolution in our understanding. 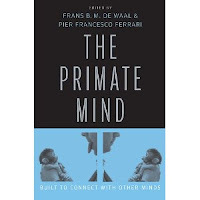 This collection of essays, the result of a 2009 conference organized by primatologist Frans de Waal and ethologist Pier Francesco Ferrari, presents an authoritative, surprising and enriching picture of our monkey and ape cousins. We now know that they have remarkably sophisticated social minds, and that their poor performance in social tasks set by humans was more a result of researchers asking the wrong questions than deficiencies in their experimental subjects. A. SHAH/NATURE PICTURE LIBRARYYoung chimpanzees watch and mimic an adult as she digs for termites, showing that the ability to learn by observing others is not unique to humans. For example, a chapter by psychologists April Ruiz and Laurie Santos explores whether non-human primates can monitor where others are looking and use that information in their own decision-making — a test of whether the animal understands what another perceives. Primatologists first tested this by seeing whether monkeys followed an experimenter's gaze to find a box containing food. The animals performed unexpectedly poorly. But changing the task from cooperation to competition unleashed the primates' true potential: macaques readily stole food from humans who looked away, but refrained from doing so when watched. Placing the task in a setting more relevant to macaque social life, which is less cooperative than our own, emphasized the continuity between our social mind and that of our primate ancestors. The Primate Mind shows how this discrepancy between neural similarities and behavioural dissimilarities has been resolved. There is more than one way to copy others: one can either mimic every detail, or achieve the same goal by different means. Recent studies, reviewed in chapters by cognitive biologist Ludwig Huber and by primatologist Andrew Whiten and his colleagues, reveal that apes will rationally shift between these alternatives. If apes see a man pressing a button with his head because his hands are occupied holding a blanket, they will press the button with their hands. Apes thus demonstrate something smarter than simple imitation — the ability to infer why a person is doing something in a particular way. But if the man's hands are not occupied, giving the ape no clue as to why the person would push a button with his head, chimpanzees tend also to use their heads. It is one of many illustrations of how easy it is to misinterpret experimental results: the apes' ability to copy the details of an action only when it makes sense was misinterpreted as an inability to imitate fine details. One by one, claims to human uniqueness have fallen. Other essays by de Waal and anthropologists Brian Hare and Jingzhi Tan show that our primate cousins share empathy and the inclination to cooperate. Apes console other apes after conflict. Chimps overcome their fear of water to save a drowning chimp. Monkeys can favour actions that benefit other monkeys. Apes even recruit other apes to collaborate with them, and will negotiate a fair distribution of pay-offs. Clearly, we are different from other primates. I have never seen macaques display anything like a toddler's eagerness to imitate. The Primate Mind suggests that it may not be the capacity to imitate, but the motivation to do so that sets us apart from other animals. 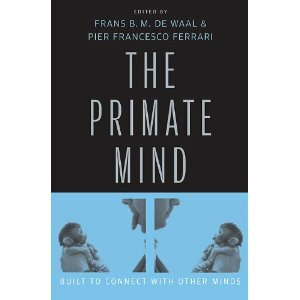 Like all good suggestions, this opens the door to more questions about the mechanisms and evolution of such motivation — and, ultimately, about how our own social minds evolved from the deeply interconnected minds of our primate cousins. Read the full review here (you may need subscription to access it). And far from being threatened by this decline of uniqueness, celebrate the interconnectedness. It is these connections that also illuminate the way things have come to be - from stars and planets to cauliflower and humans. Then wouldn't that hint about a possible alternate view that human intelligence and comprehension is not just the function of its complex brain alone? Afterall humans and apes have so much similar brains but so much different intelligence. An ape's comprehension is closer to that of birds like crows, but with immensely different brains. What do you reckon? You misread the article. The ape comprehension is much closer to humans. That was the point of neural and behavioral connection. The mention of crows was in the point regarding tool use - which, in the past, was considered to be the sole domain of humans. Now it is quite clear that other animals use it too, including crows. You mean, their comprehension is something like 98% of humans, based on their close genetic and neural makeup? Birds build homes and apes don't, birds are chaste, a vary human moral behaviour, and apes aren't, birds have a vocabulary, apes don't have, (And if you have ever pet a parrot, you would realize sometimes they do make more sense than simple utterances). So where would you place the comprehension of an ape as compared to humans, 0.1%? 0.2%...0.5% tops, thats it? It is like comparing Martian atmosphere to that of Earth's. If you run the numbers, it is only something like 0.7% to that of Earth, which one may find being closer to that of Triton's atmosphere or vacuum. And Universe is big, there is every possibilty of intelligent life in our galactic neighbourhood, with vastly different intellect, for whome ours might be no more than like that of a fish or garden mollusc...something to be really afraid of. The old man in the wheel chair may be right. OMG. You are absolutely right. It is birds that are 98% closer to humans in comprehension. Apes are in fact closer to sloths. Oh wait. Sloths, actually move slow - so they must be contemplating a lot too. So...actually apes may be below the sloth level too. So the real comparison would be between Pluto's atmosphere and the Earth. Please calm down bro. I didn't mean a useful argument to go down into tantrums. I'd stop here. It was not a tantrum - I was trying to see the world from your logic. But in general, I have also seen the tone of your comments in the past - a rich tapestry really - so pardon me if my second response (not the first one - but then none of the arguments from the posted article were really engaged in your response) had a tinge of sarcasm in it. Salman, my question is, if the apes are so close to us in terms of their gross anatomy, why is there such a gulf between the intellectual capacity of the two? Did we just grow our brains for millions of years without changing anything in our anatomy? There are many similarities as well as differences. For example, the chimpanzee brain is about 1/3 the size of human brain (and not 98%! The genetic similarities in the 95-98% - but the sizes are different). That certainly limits certain cognitive processing. But biologists usually consider the differences a matter of degrees not kind. One of the important aspects is having a theory of mind (an understanding that another animal is also thinking). This is a sophisticated level of thinking and has been shown in different apes (for example, they would deceive the animal to hunt). The example in the article about the opening of the door is another great example. Of course, chimpanzees and bonobos live in complex social societies. Now many of the early hominids also had smaller brains. However, homo sapiens and the neanderthals have had the largest brain/body ratios. Why did they develop such larger brains? This is a tough question - but there are a number of ideas out there. One of the fascinating ideas out there is that the invention of fire - and the resulting cooking of food - may have been one of the reasons for the development of larger brains. On this particular topic, check out Richard Wrangham's book: Catching Fire - How Cooking Made us Human. The lowest IQs are those of the indigenous people of Botswana and Australia, who were mostly bush hunters. Does that explain the idea up to some extent? "The lowest IQs are those of the indigenous people of Botswana and Australia, who were mostly bush hunters. Does that explain the idea up to some extent?" I don't think so. First of all, such impacts on evolutionary scales probably takes hundreds of thousands of years. Second, the bush hunters also have fire and probably cook food. The Wrangham idea is about hominid species and their change of diet around 1-3 million years ago. And finally, IQ studies - and what they mean for intelligence - are actually highly unreliable. So I won't make much of this. Just a bit off-topic but an interesting find. In one of the sermons by a prominent Muslim cleric many years ago in his ashura address (Allama Talib Johari), he suggested that the human newborn is possibly the most helpless and dependent offspring amongst all the living creatures and remains so for the longest period of time (even a joey has to climb its own way into the pouch - my two cents). According to him, this might be the basis for parents to stay together long enough to constitute a home. And the concept of grand-parenting (unique to humans and whales, controversially in some avian species too) formed several homes together to eventually establish a human society. To me it sounded like an interesting concept - the extreme helplessness of a human offspring as possible basis of the evolution of human society. Though the cleric did issue a disclaimer at the end that he was not an evolutionary biologist and he was just talking of a philosophy in his mind. What would be your idea on that?